A prominent Syrian cleric threatened to walk out of a conference for Middle Eastern Christians after Sen. Ted Cruz (R., Texas) defended Israel in a speech before demanding that the Texas Republican leave the event on Wednesday night. While organizers for the In Defense of Christians summit said that only "a few politically motivated opportunists" disrupted Cruz’s remarks, and that they were "made no longer welcome," the videotaped tirade indicates that top attendees protested Cruz’s speech. Patriarch Gregory III Laham of the Antioch Church was one of the six Middle Eastern patriarchs who attended the conference, and part of a small delegation that met with President Barack Obama on Thursday. After Cruz was shouted off the stage for calling on audience members to stand with Israel, Laham threatened to walk out of the event if the senator didn’t leave. "[Cruz] should get out," said Laham in Arabic, pointing at the empty stage. "What is this? He’s cursing us all out? We cannot accept this. Our ears cannot hear this. We are tolerant of everyone." A woman in the background can be heard repeatedly shouting in Arabic, "We’re all going to walk out!" Laham continued, his voice rising, "Who had the Jews leave Lebanon and Syria? They [the Americans] did. Who had the Jews leave Iraq and Baghdad in 1972? They did." A male voice can be heard yelling repeatedly in English "shame on them!" Laham then asked in Arabic if Cruz left. After being assured that he was no longer at the event, the patriarch and others walked back into the gala hall. Lebanese newspaper Al-Nahar reported that Laham and other Middle Eastern Christian leaders also refused to participate in a panel sessions that included Rep. Chris Smith (R., N.J.), because the congressman was expected to read a statement that condemned Syrian regime leader Bashar al-Assad. Two other patriarchs reportedly left the session in protest. 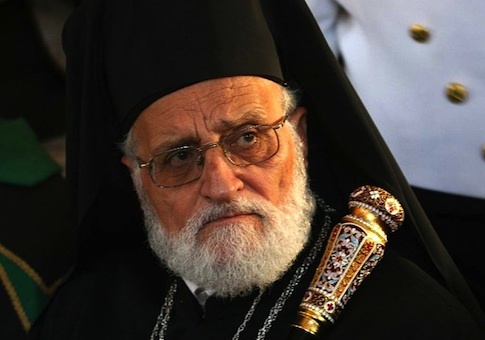 "Lahham refused to attend the session and registered his objection, as did Patriarch Younan and Bishop Zahlawi, which made the conference’s director to inform Patriarch Rai and Patriarch Aram, who left the session in protest," said a statement from the Greek Catholic Patriarchate, quoted in Al-Nahar. Laham has previously claimed that a "Zionist conspiracy against Islam" is responsible for al Qaeda attacks on Iraqi Christians. Meanwhile, the pro-Assad Lebanese newspaper An Safir weighed in with its own views on the Cruz incident. "If it was true that Maronite Patriarch Beshara Rai feared that the [Israel] issue was ‘planted’ to sabotage the conference, was it possible to avoid it? If yes, why did it happen to begin with?" the newspaper asked. "Are the organizers unaware of Ted Cruz’s bio—the Republican presidential candidate who no one disagrees about his extremist leanings toward supporting Israel ever since winning his seat in Congress for the state of Texas in 2012, supported by the Tea Party, which in turn is supported by a filthy rich Jewish organization?" "Did they miss that Cruz is known to be the representative of the southwest for Israel in Congress, in parallel to Sen. Marco Rubio who represents the south, and considered a neocon who supports violent solutions and more spending on wars, especially in the Middle East?" the paper added. This entry was posted in National Security and tagged Barack Obama, Hezbollah, Israel, Ted Cruz, Terrorism. Bookmark the permalink.